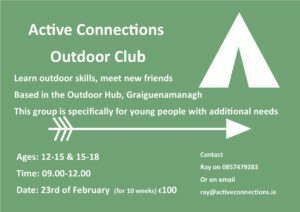 Nicholas Mosse Pottery - Trail Kilkenny | Get Outdoors! Over the last 45 years, Nicholas Mosse pottery has evolved from a one man pottery operation into a world famous handcrafted production pottery employing 60 plus local people. 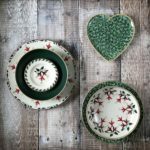 It has drawn its inspiration from the surrounding countryside and earlier Irish folk traditions, and its charming and colourful designs can be traced right back to early 19th century Irish country life. 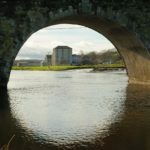 The visitor will first see the renovated flour mill sitting calmly next to the River Nore where a viewing area is an inviting welcome. Inside, this flagship store carries everything the pottery makes plus all sorts of other goods to make a country house a country home. 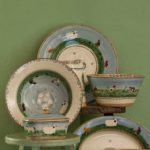 The pottery has found fans all over the world and has graced the shelves of many fabulous shops (Tiffany’s, Bloomingdales, et al.). Irish woollens blend with other European crafts and gifts to inspire any visitor to indulge in a bit of Irish style. The makers and crafts people can be viewed through large glass windows or, if a tour is booked, the visitor will be taken inside and walked through every stage of the pottery production. Seeing the intricate hand decorating is always a mind blowing experience. Behind the scenes Nick’s insistence on ecologically sound practice can be glimpsed: the river provides hydro power for electricity and all possible recycling is undertaken,---from clay to water to waste. A visitors’ area displays the history of the mill and the pottery and Nick’s large collection of early Irish spongeware can be seen in the charming upstairs café. Altogether this old mill provides a wonderful, relaxing and interesting afternoon; it is a must-see for any visit to the area. Visitors can browse among a huge selection of Nicholas Mosse pottery, linen and glass, over three floors of the store. 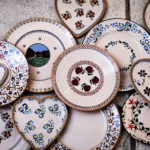 Visitors can watch their potters and decorators at work through glass windows, throw the shapes, fire up the kiln, glaze, paint and sponge-decorate each individual piece of Nicholas Mosse pottery by hand. Nicholas Mosse Pottery offer tours on Mondays, Tuesdays and Wednesdays. They require a minimum of 10 people to book a tour. Cost is €5.00 per person. Tours are conducted by a pottery staff member and take 30-40 minutes. They require advance booking. Visitors can end their visit in the cafe which is housed upstairs in the attractive mill providing splendid views of the River Nore. Lunch is served daily. The shop closes at 4pm on Christmas Eve. Shop Closed Over Christmas 25, 26, 27 and 28. Reopens on 29, 30 and 31 - Closed on 1st January. Please note: On Bank Holidays - we are open normal hours as listed above.